When I began considering an extended period of travel, it was, in part, because I needed a change. I had been deeply disappointed and derailed by an overturning in my life and I needed distance. I was physically, emotionally and spiritually depleted and I needed to lay new tracks toward respite, renewal, and relief. Like Gustave Flaubert, I was eager to be “transplanted by the winds.” Like Charles Baudelaire, I was eager to be in the places of departure and arrival, eager to be aboard machines of motion. Like Edward Hopper, I was seeking the poetry in a train car, the sanctuary in a coffee shop, the message in a neon sign. Like Alexander von Humboldt, I was seeking knowledge, an expansion of my understanding of the world and its workings. Like William Wordsworth, I craved the restorative power of nature. BUT, ultimately, foundationally–through and through–what I needed most was the ministry of the sublime. I needed to hear from God. I wanted to connect with His artistry in nature and be awed by His power breathed in and through the created order. My spirit craved healing and I was eager to paint what I learned and saw and felt and heard and smelled–all that I experienced with every sense and every fiber of my being—with words and photographs and sketches. As I made plans with my husband Gene to set off for parts unknown, I was filled with anticipation and ready to embrace the unrefined realities of wayfaring. Like Mr. Toad and his friends from The Wind in the Willows, I delighted in considering what the open road, the dusty highway, the heath, the common, the hedgerows and the rolling downs might hold in the way of adventure. 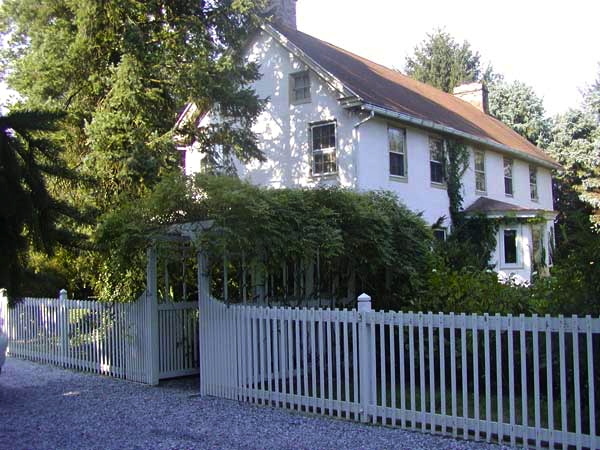 Our former home in Chester County, Pennsylvania. And so, as 2010 was drawing to a close, Gene and I sold our home in Pennsylvania and prepared to set out to gather experiences—outside of our experiences—on a road trip across the United States. We traveled down the eastern seaboard, across the south, up through the mountain states, and out to the west coast. From Washington state, we made our way down the Oregon coast and then headed back east via a route that took us through California, Nevada, Utah, Arizona, New Mexico, Texas, Oklahoma, Tennessee and the Carolinas. 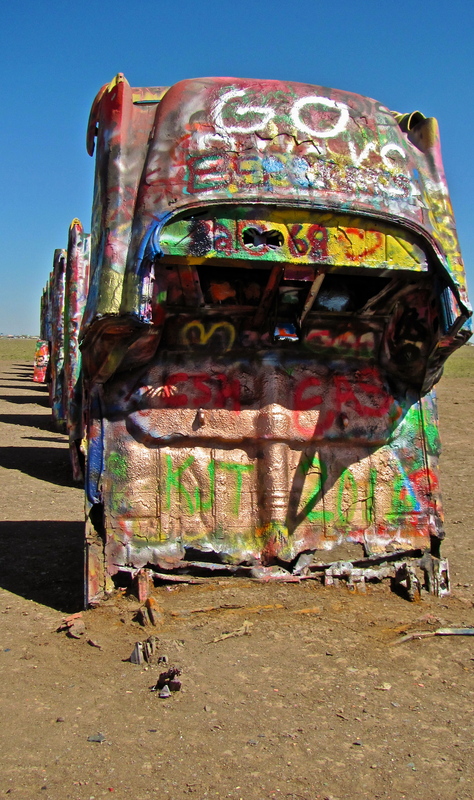 All totaled, over the ensuing years, we havee wayfared our way through 30 states. I also took one “side trip” to the island of O’ahu. How we roll. 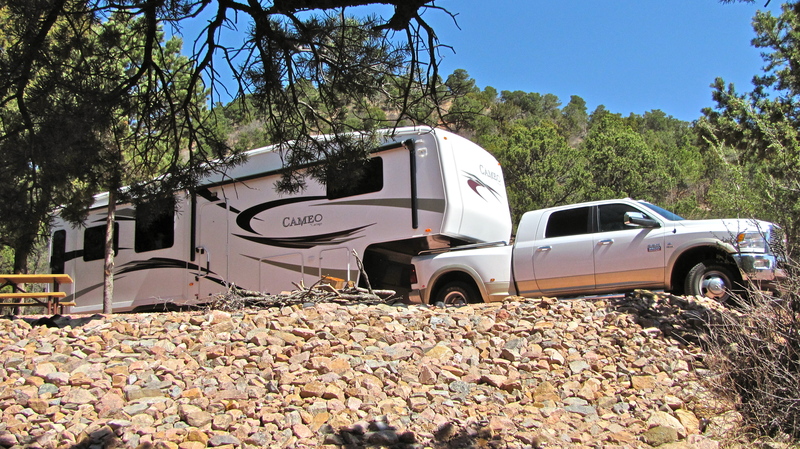 Mountaindale Campground, Colorado Springs, Colorado. Along the way, we’ve met fascinating people, from goldpanners and a family of wild mushroom pickers in Oregon to a moonshiner in Louisiana, from a mariachi band in Texas to Gullah-Geechee sweetgrass basket weavers in South Carolina. We’ve spent delight-filled days marveling at glorious natural wonders from the majestic Grand Canyon in Arizona to the hoodoo-filled Bryce Amphitheater in Utah, from the lush and soul-soothing Appalachian Mountains in Tennesee to the barren salt flats of Badwater in California’s Death Valley. We’ve work-camped on a ranch, in a swamp, on a vineyard, and on a golden coast. We spent a year at Grand Canyon National Park where I served as a guide and instructor with the Grand Canyon Field Institute and worked two to three days a week in Kolb Studio, the home and workplace of two pioneering photographers. (At the same time, Gene worked at the Verkamp’s Visitor Center.) We thoroughly enjoyed exploring, hiking, backpacking and learning about the Southwest. The night skies were spectacular as were the sunsets over one of the Seven Natural Wonders of the World. View from Bright Angel Trail, North Rim, Grand Canyon National Park, Arizona. We’ve risked much but have gained much. Along the way, we’ve also had a good many surprise encounters with wild animals, many of which we found in new and unanticipated habitats. Our companions have been grizzlies, black bears, wolves, coyotes, bighorn sheep, prairie dogs, pronghorns, mountain goats, alligators, lizards, sundry insects, shore birds, birds of prey, elk, bison, creatures of the sea, even a band of beggin’ burros. My Massachusetts-born and bred husband learned to drive a hay rake and herded 250 head of cattle across eight miles of the Badlands (in the company of a real cowboy). I starred as the murderer in a staged production of the 1940s era Inner Sanctum radio play, “The Voice on the Wire.” Our truck suffered a smashed windshield and our camper, a couple of double-tire blow-outs on one side. I suffered a serious reaction to some tainted water in South Dakota and overdid the heat and wind while dry camping and hiking in Death Valley. Truth be told, we’ve had a good many other misadventures. I am profoundly grateful, however, for every single moment. Like Lord Byron, I have experienced “rapture on the lonely shore” and have partaken of the healing solace found “in pathless woods.”* I know now, on a deeper level, that polish comes through trouble and that not a single heartbreak in one’s lifetime need go to waste. All things can be used of God to develop in a believer an unshakeable trust in Him. He is the Rock of Ages and I am confident that He holds me tight in the place cleft especially for me. I have been where I have been and I am where I am and the journey is reshaping me and will be with me always. Augustine described the world as a book and he asserted that those who do not travel read only one page. With this road trip added to earlier excursions, I’ve now read—or, at the very least, perused—all 50 states, all of the Canadian provinces (save for Nunavut), and many countries in Europe, Asia and Africa. 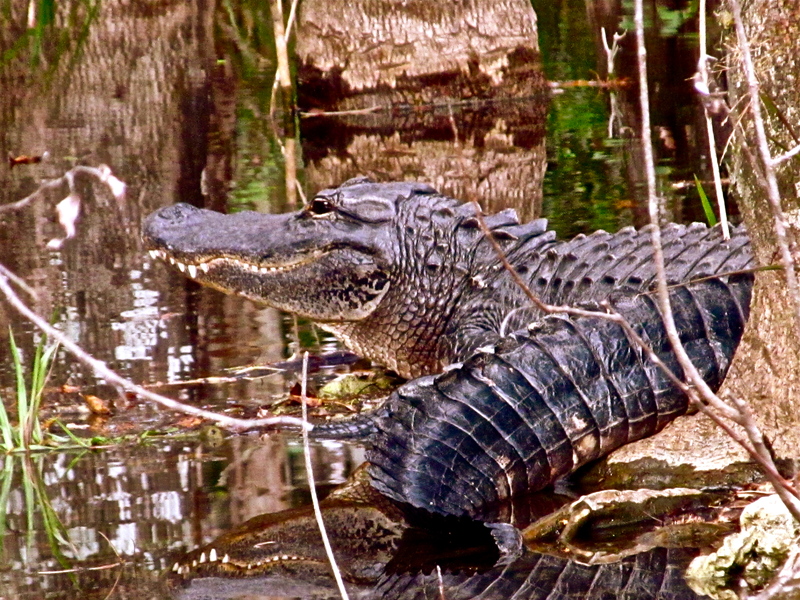 American Alligator, Big Cypress National Preserve, Ochopee, Florida. After we left the Canyon in September of 2014, we spent nearly a year living in Big Cypress National Preserve where we divided our time between exploring the great swamp and surrounds and working in the art gallery of large format black and white photographer Clyde Butcher. Two books on which Clyde and his wife, Niki, and I collaborated, were released in 2016. I edited the first, Big Cypress Swamp: The Western Everglades, 2nd Edition, and wrote the second, Celebrating America’s National Parks, to accompany Clyde’s magnificent photographs. The latter volume placed first in the category of “Professional Book-Nature” in the 2017 International Photography Awards competition. We are now sojourning in North Carolina where I have been photographing along the coast from Topsail Island to the Outer Banks. You can view my photographs at: http://www.dfghailsonphotography.com. I am also at work on The Rockery, a book about theology, nature and the arts as spiritual ambassadors for the Christian faith. 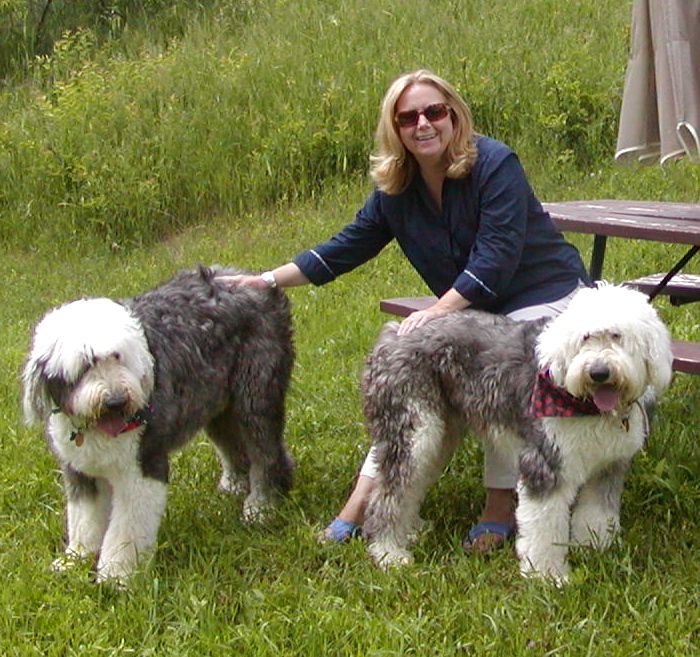 On this site, you will find introductions and links to On the Road with Mac and Molly, a program I hosted on Pet Life Radio, until our darling Old English Sheepdog, Mac, succumbed to cancer at age 9. His sibling, Molly, exceeded the life expectancy of Old English, living to age 13. Wild Life! Wild Places!, a new series I’m hosting, has debuted on the same network. I had taken a l-o-n-g hiatus from it after the first couple of episodes and am back to writing and recording for the show. I’ll be posting previews and links on this site. Here you’ll also find a page of suggested books that may reignite your mind and spirit. Another page offers inspiring quotes on travel, art, culture and nature, written— over the centuries—by sundry travelers and writers. A last little bit on my professional background: I’ve worked as a professor of personal, congregational and community renewal, urban ministry and world religions and directed a Doctor of Ministry program in the Renewal of the Church for Mission. As an ordained American Baptist minister, I have pastored congregations in Massachusetts, Pennsylvania, New Hampshire and North Carolina. I have extensive training and experience in relief work and disaster response and have led a number of ministries and non-profits charged with helping society’s at-risk, homeless and marginalized individuals and families. My articles, columns, and book reviews appear in professional journals and popular magazines. Profiles of my life and ministry have been featured in periodicals, on television (including a Billy Graham telecast), and in a book (More to Be Desired than Gold). Included in the recognition I have been honored to receive are an Eastern Seminary Student Assembly award for excellence in teaching; a Christianity Today Book of the Year award; a United Press International award for excellence in news writing; and a Church of the Year award (celebrating the ministry of the congregation I pastored in New Hampshire). 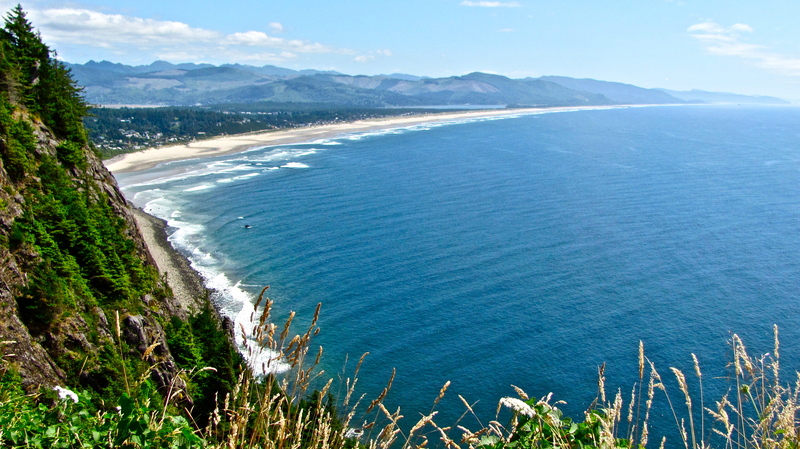 Along the north Oregon coast. “As dying and behold we live” (2 Cor. 6:9). “I had a bed of asters last summer, that reached clear across my garden in the country. Oh, how gaily they bloomed. They were planted late. On the sides were yet fresh blossoming flowers, while the tops had gone to seed. Early frosts came, and I found one day that that long line of radiant beauty was seared, and I said, “Ah! the season is too much for them; they have perished”; and I bade them farewell. I disliked to go and look at the bed, it looked so like a graveyard of flowers. 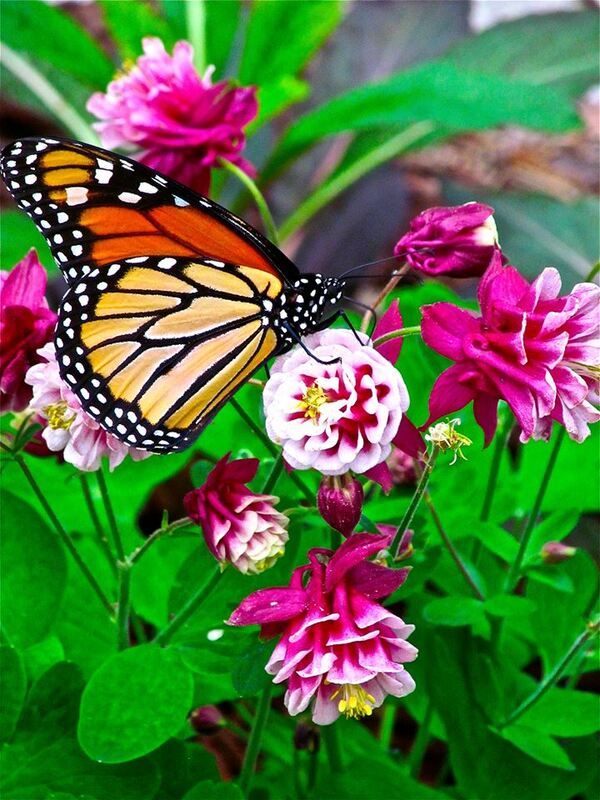 But, four or five weeks ago one of my men called my attention to the fact that along the whole line of that bed there were asters coming up in the greatest abundance; and I looked, and behold, for every plant that I thought the winter had destroyed there were fifty plants that it had planted. What did those frosts and surly winds do? Pet Life Radio image by Pet Life Radio.